This is the smallest of all the Saints, to the extent that it barely exists at all. A farmhouse, a massive former Rectory (which I plan to live in, when I win the National Lottery), a disused garage and a couple of cottages are barely company for the curious church, for it sits out in the fields, and the road up to it falls short by 100 metres or so. A designated footpath leads along the edge of a ploughed field, and will take you to the east side of the churchyard, but it isn't easy going, even outside of winter. But the reward is the most wonderful setting, especially when the graveyard is high with the wild grasses of early summer. As I stood to the south of the church looking back at it, the wide open fields behind me, the sun came out, and suddenly it was beautiful, a perfect moment. There is a crispness to the exterior, and it was all heftily restored in the 1870s, a late date for what was done inside, but the exterior is a curious mixture of Decorated and Norman, which must either have echoed what was here before, or just looked nice on the drawing board in London. You might wonder why there are two large Decorated windows in the north wall, with lancets either side of them. If you step inside, you'll find out. This church is always open, twenty four hours a day. The curious thing about the Restoration of the 1870s is that it has left us a prayerbook church, one of very few in the country from that century, which devoted most of its energies into destroying them. A pulpit sits between the two large windows on the north wall, and all the benches are angled towards it. Such a Protestant restoration must be almost unique in the 1870s, when even J.C. Ryle at Helmingham and Stradbroke was using the eastwards position. Despite what amounted to a near-rebuilding, All Saints is the only church in the Saints with considerable medieval survivals. On the north side there are two dear little roundels of Continental glass; one is of St Ursula holding a ship and an arrow, and the other of St Dorothy with her flowers, basket and the Christchild. In the south aisle are two composites, one largely consisting of part of a King David figure, the other a curly-haired angel. The great square Norman font with its panelled sides sits on a pedestal at the back of the church, and beside it is a medieval bench with two curious bench ends. One is a floppy-eared dog, while the other is a creature with a long, curved neck. It is probably intended as a camel, but it may actually be a giraffe. These were known to late-medieval Suffolkers (there is one in a bench end at Dennington) but they appear not to have known that their long necks would be erect. There is something particularly enticing about a church which has a sense of its 19th century days. At the time of the 1851 Census of Religious Worship, there were 232 people living in this parish, an extraordinary number compared with today. Most of them must have lived and worked on local farms, and on the morning of the census 87 of them made there way here for George Sanby, the Rector of Flixton, to lead them in divine worship. 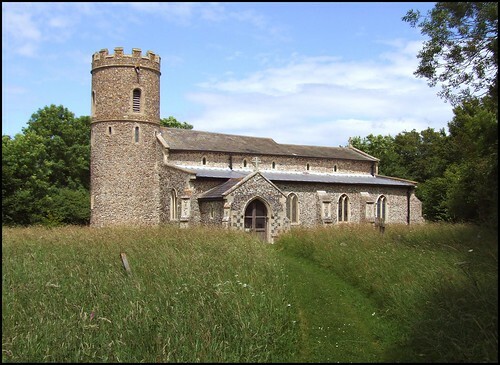 This figure of one in four is very high for Suffolk, and another 33 were in the local Methodist church, suggesting that they were a particularly religious lot in this neck of the woods - or, perhaps, that the local landowners were insistent that their employees went to church. Today, without a parish to speak of, it is inevitable that this church has been declared redundant. The Churches Conservation Trust do their usual fine job in looking after it. That it is the only one of the Saints to have suffered this fate is more remarkable.